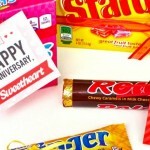 Marriage is wonderful, crazy, fun, and sometimes incredibly difficult. Making the first move after a disagreement can be challenging, especially when you’re not sure what to say. 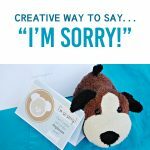 This quick idea will help communicate those magic words, “I’m Sorry,” after a mistake has been made. All you need to do is download and print out this adorable PRINTABLE designed by the talented ladies at Merrymint Designs. 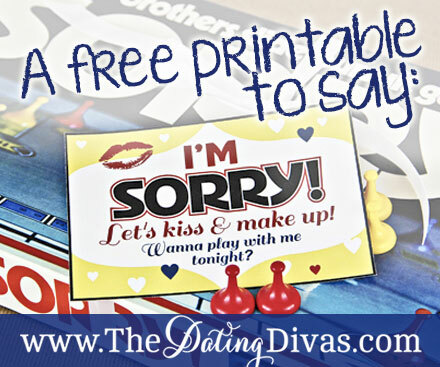 Then, cut out the card and leave it next to the board game Sorry in a place where your spouse will see it. 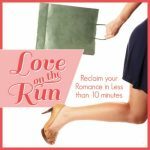 Your sweetheart won’t be able to resist this sweet little love note that also doubles as an invitation to spend some quality time together. My husband got a kick out of playing the classic board game! We hope that this quick and easy idea will have the two of you laughing during a round of friendly competition in no time! 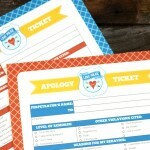 Looking for other “I’m Sorry” ideas? 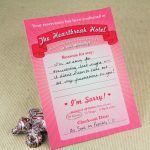 Check out these creative posts: The Doghouse, A Sincere Apology, and Reservation at the Heartbreak Hotel. Now go kiss and make up! Fun! What a great idea!